Gifted theologians offer much guidance in areas like biblical theology, Christology and ethics, but resources that set forth ecclesiology are rarer, particularly from a robust Baptist perspective. 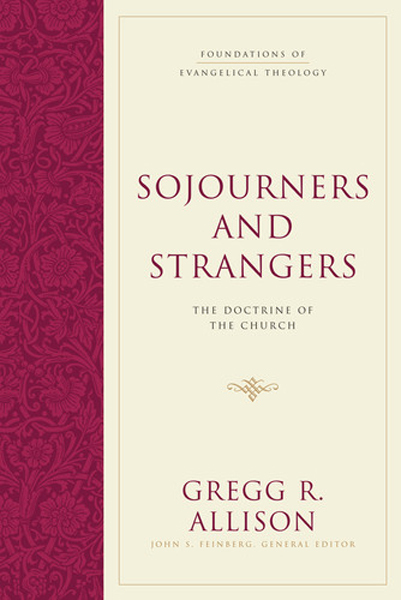 Gregg R. Allison, professor of Christian theology at Southern Seminary, fills that void with his latest book, Sojourners and Strangers. “The church is the people of God who have been saved through repentance and faith in Jesus Christ and have been incorporated into his body through baptism with the Holy Spirit,” he writes. Observing that church experience often influences the development of ecclesiology, he examines the sufficiency of Scripture in forming this doctrine and offers helpful tips for distinguishing between normative and relative passages of instruction in the New Testament. “The church of Jesus Christ itself is a necessary reality,” Allison writes. Emphasizing the role of the church in Christian life, he describes seven characteristics of the church’s origin and vision: doxological, logocentric, pneumadynamic, covenantal, confessional, missional and eschatalogical. Allison identifies a lack of church discipline as the greatest problem in American evangelical churches and a hindrance to achieving purity. Allison urges churches to practice discipline as a future warning, and reminds them of the presence of Christ through this difficult process. Since church polity is a defining mark of Baptist ecclesiology, Allison surveys the various offices of the church and summarizes the main forms of church government. Allison advocates plural-elder-led congregationalism, which he argues has historical precedence in Baptist life. 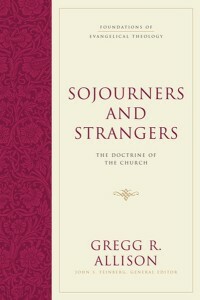 Readers may be surprised to find an academic endorsement of multi-site churches, and should examine the biblical basis for Allison’s arguments; Allison is an elder at Sojourn Community Church, Louisville, Ky.
Countering what he sees as apathy in administering ordinances in many churches, Allison offers a theological basis for a careful and deliberate approach to baptism and the Lord’s Supper with local churches. The final section of the book handles the ministries of the church, which encompasses not only spiritual gifts but also worship, preaching, evangelism, discipleship and member care. Ultimately, according to Allison, “the church is a paradox,” loving her neighbors through culture-building while opposing the fallen world.